Customized imprinted box cutters have many uses. Personalized retractable box cutters have safety shields to prevent accidents. Prices shown for logo utility knives include your personalized message on one side. Two color imprints are also available on these promotional box cutters. Our Wholesale prices make these promotional tools very affordable. An additional $60 non-refundable artwork charge per personalized imprint position and color must be paid before work can begin. Prices above include a 1-color customized imprint on 1-side. 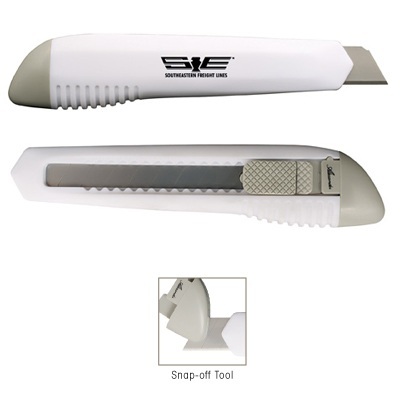 Pen sized retractable utility knife has thumb slide blade. Blades are divided in useful increments for easy breaking and sharp cutting power on demand. Available in White, Yellow and Safety Orange - Custom Imprint Area: 1/4" x 2". 8-section blade with locking slide. Removable slotted top safely breaks blades. Large snap blade cutters have a plastic body. Comes in white/grey. Item size is 6.38" long x 1.38" wide x .5" deep. Imprint area is 2" long x .44" high. An additional $55 non-refundable artwork charge per imprint position and color must be paid before work can begin.